Why, taking Silas Wegg on his walk through Clerkenwell towards Boffin’s Bower and the Roman Empire, did Dickens make him stop at Mr Venus’s taxidermy shop? Prosaically, we could say that despite all his experience with serialised fiction, he had become engrossed in the drama and pathos of Chapter VI and had over-written Part 2; he needed a short, comic episode to fill the place of the material that eventually became Chapter X in the next part. Dickens went on his own walk through Seven Dials with his illustrator, Marcus Stone, and visited a taxidermist called Willis, whose assistant and shop subsequently appeared, made over in Dickens’s comic-grotesque mode, in Chapter VII. David McAllister, Lecturer in Victorian Literature at Birkbeck and Course Director of its MA Victorian Studies, writes about Dickens’s recycling, Harmon’s dust, imaginary electric messages and some entries in Dickens’s notebook. On his own small estate the growling old vagabond threw up his own mountain range, like an old volcano, and its geological formation was Dust. Coal-dust, vegetable-dust, bone-dust, crockery dust, rough dust and sifted dust,—all manner of Dust (p. 10). 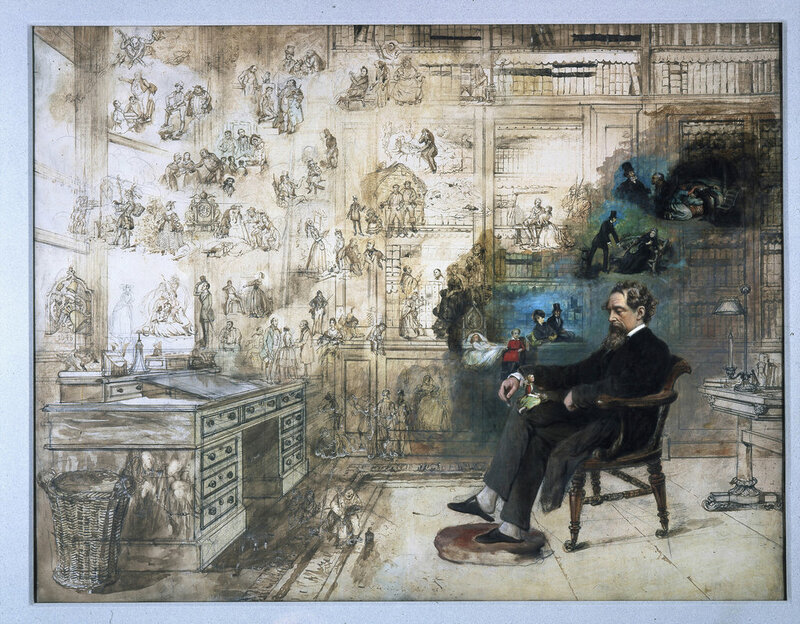 In his famous watercolour ‘Dickens’s Dream’, R. W. Buss shows Dickens asleep in his study surrounded by a transparent, almost spectral crowd of his fictional creations. Isabel Davis, Senior Lecturer in Medieval and Renaissance Studies at Birkbeck, University of London, offers a Medievalist’s view on the first monthly instalment of Our Mutual Friend. Isabel is also a member of the Birkbeck Material Texts Network. When Charley Hexam is shown into the Veneerings’ library, in the first instalment of Our Mutual Friend, it is said that he ‘looked at the bran-new pilgrims on the wall, going to Canterbury in more gold frame than procession, and more carving than country’ (p.13). This picture of Chaucer’s pilgrimage is part of Dickens’s scrupulous depiction of the Veneerings’ household interior and, given the brevity of its mention, is evidently an image which was firmly lodged in his readers’ immediate cultural index. I wonder if it was the Victorian equivalent of Tretchikoff’s Chinese Girl, the world’s most popular picture of the 1950s and ‘60s? Luisa Calé suggests to me that it could be a print of the pilgrimage based on the painting by Thomas Stothard. Indeed, the catalogue of the Tate Gallery suggests that just such an engraving, made by Louis Schiavonetti and James Heath, was ‘a great commercial success. In 1855 it was said that “few, if any, engravings of that period were so popular with the public”’ – just the sort of thing, perhaps, which the suggestible Veneerings, with their predictable popular tastes, would hang in their library. Highlights of the first part of the ‘Our Mutual Friend Tweets’ project can now be found on Storify! Click here to catch up on the latest developments. And be sure to bookmark ‘Our Mutual Feed’ to keep up with the story day-to-day. By 1864, Dickens’s many faithful readers had long become accustomed to openings which are as much rhetorical as narrative tours de force. The larger the scope of the novel, the more extravagant the figures of speech which inaugurate it – witness Bleak House. Our Mutual Friend does not disappoint, in this respect, with its birds of prey, its leaves in the Twemlow, and its Analytical Chemist. But there’s a difference, too, a new and unsettling volatility. Rhetorical method swells to bursting point. Figures of speech impiously assume a life of their own. In order to take the measure of what’s new and strange about the first instalment of Our Mutual Friend, we’ve decided to concentrate on two salient turns of phrase. The last advertisement wrapping the first instalment of Our Mutual Friend is for Heal and Son, announcing new show rooms which ‘extend their show of Iron, Brass, and Wood Bedsteads, and Bed-room Furniture, beyond what they believe has ever been attempted’: customers can now see ‘as complete an assortment of Bed-room Furniture as they think can possibly be desired’. Heal and Son were wise to obtain such a prominent place for themselves here, for Dickens had already provided one of their competitors with some free advertising in Chapter II. The Veneerings are the kind of customers of which the new department stores must have dreamt: ‘their plate was new, their carriage was new, their harness was new, their horses were new, their pictures were new’ and ‘if they had set up a great-grandfather, he would have come home in matting from the Pantechnicon, without a scratch upon him, French polished to the crown of his head’.